Poisoning; Potassium Permanganate; Methylene Blue; Methemoglobinemia; Acute Respiratory Distress Syndrome. Acute poisoning by potassium permanganate is a rare condition with high morbidity and mortality. Diagnosis of the condition relies on a history of exposure or ingestion and a high degree of clinical suspicion. Oxygen desaturation and the presence of methemoglobin are also helpful indicators. Since no specific antidote is available, treatment is mainly supportive. Few cases have been reported in the literature following potassium permanganate ingestion, whether intentional or accidental, and most of the patients in these cases had unfavorable outcomes, which was not the case in our patient. Our patient, a 73-year-old male, purchased potassium permanganate over the counter mistaking it for magnesium salt, which he frequently used as a laxative. Several hours after he ingested it, he was admitted to the endocrine department at King Hussein Medical Center, Jordan, with acute rapidly evolving shortness of breath. During hospitalization, his liver function tests deteriorated. Since he was diagnosed early and managed promptly he had a favorable outcome. Acute poisoning is a worldwide problem,1,2 with a different pattern in developed and developing countries.3,4 It is usually caused by the ingestion of medications in developed countries and of pesticides in developing countries.3,5 Poisoning can be either intentional (deliberate, suicidal) or unintentional. Most unintentional cases occur in children, due to their constant desire to explore or imitate adults,3 but it can also occur in adults. Potassium permanganate is a widely available over-the-counter agent, used mainly as an antiseptic bathing agent in patients with eczema.6 Yet, despite its availability, poisoning with this substance is not frequently encountered. We present the case of a 73-year-old man who mistakenly ingested 20g of potassium permanganate salts, mistaking it for Epsom salt (magnesium sulfate). A 73-year-old Jordanian male presented to the King Hussein Medical Center, Jordan, seven hours after he accidentally ingested two large tablespoons (approximately 20g) of potassium permanganate obtained over the counter by mistake. Immediately after ingestion the patient developed severe generalized abdominal pain and recurrent vomiting. The vomit contained a large amount of the ingested solution as well as some ground coffee-like material. The patient was a chronic heavy smoker and had a history of type II diabetes mellitus (more than 20 years), hypertension, and stable coronary artery disease managed conservatively with medications. He denied any history of glucose-6-phosphate dehydrogenase deficiency (G6PD), favism, or hemolysis. The patient sought medical attention at a primary health care facility and was prescribed an antiemetic agent and told to visit an emergency department. His abdominal pain was persistent and he developed progressively worsening shortness of breath and chest tightness associated with a nonproductive cough and bluish discoloration of his lips and digits. At the emergency department, the patient was conscious, alert, and oriented. He was apparently in respiratory distress; his heart rate was 130 beats per minute, respiratory rate was 35 breaths per minute, and his blood pressure was 150/90mmHg. His oxygen saturation was 78% despite receiving high flow and high concentration oxygen via a nasal mask. On examination, his face was puffy; however, his tongue and uvula were not edematous. He was centrally cyanosed and his chest examination was remarkable for decreased air entry diffusely, prolonged expiratory phase and expiratory wheezes. His electrocardiogram showed sinus tachycardia and his arterial blood gases showed the following: oxygen saturation 94%, PCO2 33, HCO3 19.5meq/L and pH 7.4. Figure 1: Oxygen saturation at various time intervals following admission measured using pulse oximetry and arterial blood gas (ABG) analysis. Figure 2: Chest X-ray of a 73-year-old male showing prominent vascular markings, mild basal reticular shadowing and bilateral upper lobe diversion. The discrepancy between the oxygen saturation measured by pulse oximetry and that measured by direct arterial blood gases (ABG) suggested the presence of methemoglobinemia, which was an indirect measurement as direct methemoglobin measurement was not feasible [Figure 1]. 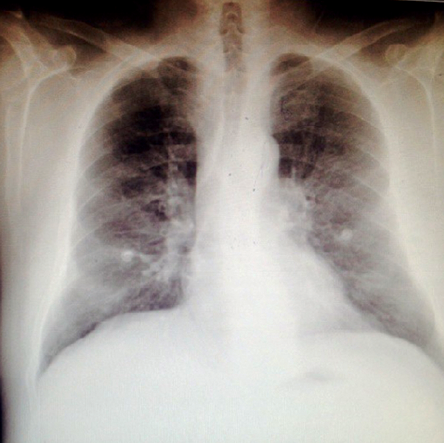 A chest X-ray was obtained which showed prominent vascular markings, mild basal reticular shadowing, and bilateral upper lobe diversion [Figure 2]. His hematology and chemistry panels were within normal limits, with the exception of a mildly elevated white blood cell count of 16.8x103/µL. His liver enzymes and coagulation profile were normal. His blood urea nitrogen and creatinine were 22mg/dL and 1.1mg/dL, respectively. After evaluation at the emergency department, he was admitted to the intensive care unit for further management. He was kept nil per os and started on intravenous steroids to reduce bronchoconstriction, broad spectrum antibiotics, proton pump inhibitors and antiemetic agents, and high flow oxygen by nasal cannula. His blood sugar was managed via continuous intravenous infusion of crystalline insulin using an insulin pump. 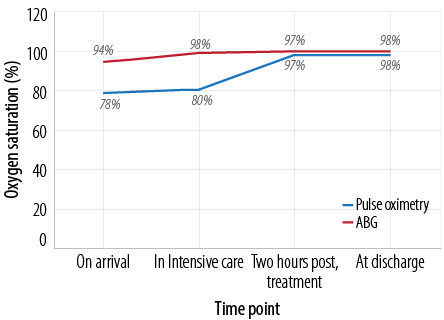 To manage his methemoglobinemia, he was given 80mg of methylene blue 1% (1-2mg/kg as recommended by British National Formulary7) intravenously over 10 minutes, after which his oxygen saturation (measured via the pulse oximetry) increased gradually to almost match that measured by ABG analysis [Figure 1]. The possibility of coexistent G6PD deficiency was excluded as the patient was elderly and had no past medical history or family history of the condition. Upper endoscopy revealed hyperemia and edema involving the whole stomach, which was more prominent in the proximal region. His condition continued to improve and he was started on oral feeding, which he tolerated well. However, three days after hospitalization, his liver enzymes increased to more than 10-times his baseline levels [Table 1]. He was conservatively managed and kept under observation. His condition stabilized and he was discharged on his pre-hospitalization medications. He has been on regular outpatient follow-up and was in good general condition, his liver enzymes levels returned to normal. Table 1: Patient’s liver enzyme levels at admission and up to day 97 post-discharge. ALT: alanine aminotransferase; AST: aspartate aminotransferase; ALP: alkaline phosphatase. Potassium permanganate binds with proteins to form proteinases and with fat to form soap, which explains the resulting necrotic ulcers that may later lead to perforation. Thus, early esophagogastroscopy is recommended to assess the extent of any burns and their progression.9 However, in our patient, the endoscopy was postponed until his respiratory and hemodynamic condition stabilized and was carried out after 48 hours. Late complications can include esophageal stricture and pyloric stenosis,9 which, fortunately, did not occur in our patient. As there is no specific antidote, the treatment of potassium permanganate poisoning is supportive and the initial management includes securing the upper airway. Gastric lavage is potentially hazardous as it can cause perforation, and the administration of charcoal is controversial.6,9 It has been suggested that milk and egg ingestion can somewhat neutralize the toxic local effects on the upper gastrointestinal tract.6 Methemoglobinemia should be promptly treated with methylene blue and vitamin C.11 While methylene blue is a recognized treatment for methemoglobinemia, it has oxidative effects, which may worsen the clinical situation especially in individuals with G6PD inducing acute hemolysis, thus further decreasing oxygen delivery to the tissues. Paradoxically, if given in large amounts, methylene blue can cause methemogobinemia. To avoid this, screening for G6PD should be carried out in patients of Mediterranean descent. If present, alternative treatment with moderate doses of ascorbic acid (300–1000mg/day) in divided doses should be used.12 However, in our patient his advanced age and negative past medical history for favism, as well as the difficulty in obtaining an assay over the weekend led us to use methylene blue. Prophylactic broad-spectrum antibiotics can be given as a precaution for the possible peritonitis resulting from perforation. The use of corticosteroids is controversial, as it acts mainly by reducing tissue edema and the inflammatory response. Our patient received both antibiotics and steroids, which could have contributed to his favorable outcome. We have reported a case of potassium permanganate poisoning. The patient presented early with acute respiratory distress and developed later impairment of his liver function tests. He was managed promptly and had a favorable outcome. Early diagnosis and prompt treatment are of the utmost importance in the management of these patients. Shadnia S, Esmaily H, Sasanian G, Pajoumand A, Hassanian-Moghaddam H, Abdollahi M. Pattern of acute poisoning in Tehran-Iran in 2003. Hum Exp Toxicol 2007 Sep;26(9):753-756. Srivastava A, Peshin SS, Kaleekal T, Gupta SK. An epidemiological study of poisoning cases reported to the National Poisons Information Centre, All India Institute of Medical Sciences, New Delhi. Hum Exp Toxicol 2005 Jun;24(6):279-285. Sawalha AF, Sweileh WM, Tufaha MT, Al-Jabi DY. Analysis of the pattern of acute poisoning in patients admitted to a governmental hospital in Palestine. Basic Clin Pharmacol Toxicol 2010 Nov;107(5):914-918. Bronstein AC, Spyker DA, Cantilena LR Jr, Green JL, Rumack BH, Giffin SL. 2008 Annual Report of the American Association of Poison Control Centers’ National Poison Data System (NPDS): 26th Annual Report. Clin Toxicol (Phila) 2009 Dec;47(10):911-1084. Jamil H. Acute poisoning–a review of 1900 cases. J Pak Med Assoc 1990 Jun;40(6):131-133. Ong KL, Tan TH, Cheung WL. Potassium permanganate poisoning–a rare cause of fatal self poisoning. J Accid Emerg Med 1997 Jan;14(1):43-45. Joint Formulary Committee. Emergency Treatment of poisoning. British National Formulary 2013;(Mar-Sep):34. Korkut E, Saritas A, Aydin Y, Korkut S, Kandis H, Baltaci D. Suicidal ingestion of potassium permanganate. World J Emerg Med 2013;4(1):73-74. Middleton SJ, Jacyna M, McClaren D, Robinson R, Thomas HC. Haemorrhagic pancreatitis–a cause of death in severe potassium permanganate poisoning. Postgrad Med J 1990 Aug;66(778):657-658. Young RJ, Critchley JA, Young KK, Freebairn RC, Reynolds AP, Lolin YI. Fatal acute hepatorenal failure following potassium permanganate ingestion. Hum Exp Toxicol 1996 Mar;15(3):259-261. Mahomedy MC, Mahomedy YH, Canham PA, Downing JW, Jeal DE. Methaemoglobinaemia following treatment dispensed by witch doctors. Two cases of potassium permanganate poisoning. Anaesthesia 1975 Mar;30(2):190-193. Er J. Neurmann G. A comparison between the effect of methanadone, methylene blue and ascorbic acid on the reduction of methemogloben in vivo. Nature. 1964 May 9;202:607-8.